First we want to thank all of our friendsthat we just saw in Europe. Hands down the best tour that we have everhad over there. It was an honor to play for you all every night. Aswe promised, we are slowly filling in summer dates so we can come play for youagain. We also have been getting quite a few requests for new countriesthat we haven't played yet. We will use this summer as an opportunity tocome to few new places. Please stay tuned for that. As for the rest of the world, we hear you,and we will be coming soon! By now you’ve already heard announcementsabout Download, Graspop, Nova Rock, and Aerodome, and there will be a lot more datesannounced in the coming months. Right now though, we have decided to hangout at home until we get over to Australia for Soundwave in February. Since we have a couple months off we wantedto update you on a couple things that we promised a while back. 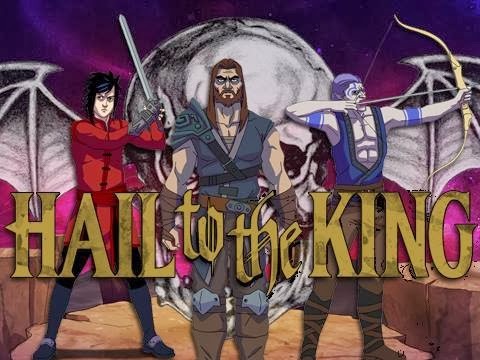 First is our "Hail to the King"animated series that we did with Machinima and Jon Schnepp. You may knowJon from his work on Metalocalypse on Adult Swim. It's funny stuff and itwas an honor to work with him. Below is the trailer for the series whichwill debut Dec. 15th. We hope it gives you something entertaining towatch over your Holiday break. The series also plays as a backstory toour mobile game "Hail to the King: Deathbat." We felt this wasthe best way to tell the story and give you all an idea about the type of gamewe are creating. This brings us to the game. Two yearsago while touring in South East Asia I looked around the bus taking us from theairport to the hotel and noticed everyone was on their phones and iPads playingdifferent types of games. We had a discussion and decided that it wouldbe fun to create one of our own. The problem was that we didn't feelpassionate about doing a full on typical music game. We wanted to dosomething different. Something inspired by some of our favorite games. So we came up with the idea of turning some of our songs and art workinto a living, breathing, evil world. We wanted to bring the story of theDeathbat to life and allow you to control its destiny. While the game stands onits own in terms of the story and game play, we still wanted to add in someextras for our fans. In the game you can unlock 16 pieces of never seenbefore artwork from all of our albums. There will also be 7 new CamRackam paintings available in the game. We also recorded 7 new songs. Now these aren't metal songs, they are theme songs for each level and aredone in an old school video game fashion with a new school twist. Therewill also be reimagined versions of older songs. Basically, we have notonly packed the game with exciting gameplay, but also a lot of things for fansthat might now be interested in a video game. The trailer for the gamewill be released with the Machinima "Hail to the King" series onDecember 15th as well. Expect a release date in early 2014 as we are inthe BETA process now. Remember, the game and series go hand in hand. The animated series tells the story "before" the game takesplace. When the series ends, the game picks up. We hope these things keep you entertainedwhile your hanging out at home for the Holiday Season. Most importantlywe hope you all enjoy the time with your families and we will see you on theroad as soon as we can make it to you. I think its sick you guys are gonna tour but what about another north american tour where you stop in nyc we are dying for and a7x show!!!! Come back to north america as soon as you can. Lol come to Oklahoma!!! 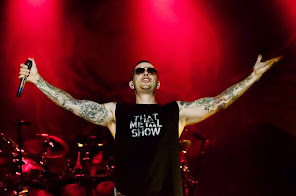 I LOVE AVENGED SEVENFOLD!! ! HAIL FROM HUNTINGTON BEACH, CALIFORNIA! !